Today's high production logger needs a loader that can quickly and efficiently process raw fiber. The Prentice 2384 is engineered with the structure, strength, speed, smoothness and stability to handle the production demands of pull through delimbing while keeping you comfortable day-in and day-out. Suttle Equipment has served the Arkansas, Northeast Texas, Southeast Oklahoma and North Louisiana areas for nearly 40 years. Our knowledgeable and award winning Parts and Service departments keep our customers up and running in today's competitive market place. Those same customers have come to expect excellent customer service from our experienced management, professional sales force and responsive support staff. You can depend upon Suttle Equipment to stand and deliver when you need quality timber harvesting equipment at competitive prices. At Suttle Equipment our goal is to supply loggers with dependable products that yield high production with low maintenance costs. We are proud to offer premium products from Prentice, CTR, Rotobec, CSI, Quadco and Pitts Trailers. As todays markets shift toward renewable and green reources, Suttle Equipment had added a new product line, the Woodsman Chipper. If your interested in starting a business in the forestry industry, or perhaps wanting to increase production of your current business and want to invest as small amount of money as possible, then preowned equipment from Suttle Equipment could be a viable option. Our preowned equipment will be conditioned and tested to perform to the specifications as intended. Take a look at our Used Equipment Section to view a list and pictures of equipment currently in stock. Suttle Equipment also has available to the customer a wide selection of hard to find and obsolete used parts for forestry equipment. Used parts are a great choice for the logger who needs to keep his equipment in running condition for the lowest price possible. 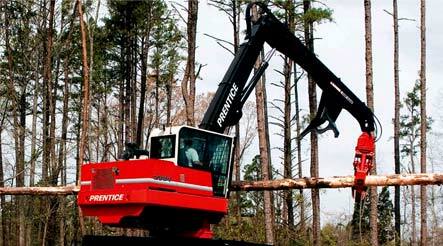 Check out our Salvage Equipment section for a list of equipment that we are currently dismantling for used parts.